The stunning cover for Mirror X immediately caught my attention, but after reading the synopsis it promised even more. I knew from page one that this was my kind of book and at that moment interviewing Karri Thompson became priority one. I was thrilled when she agreed to answer my questions for this interview as I found Mirror X to be an original dystopia with a minefield of controversial subjects. 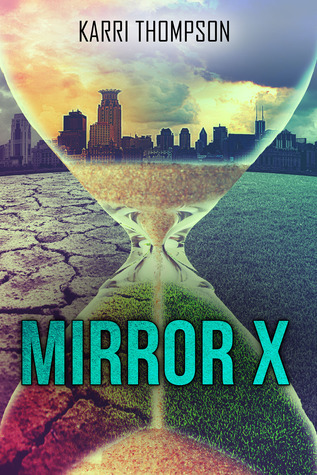 Your new book Mirror X is an original YA Sci-Fi Dystopian novel. Did your career as a high school English teacher influence your decision to write YA novels? 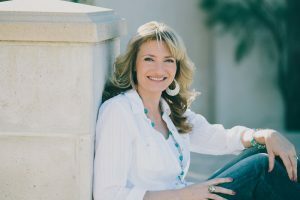 Do you find being surrounded by teen culture, as a mother of a teen and as a high school teacher, helps you stay current and up-to-date on teen language, dress, and attitudes? Have you ever based a literary character after a student or someone you know? Being a high-school English teacher did influence my decision to write YA. During the school year, I’m around teenagers 6 hours a day – approximately 180 of them. Yikes! But it does keep me current with teen attitudes, etc. Even so, I try to stay a bit generic when it comes to teen language and dress. The lingos and fashions change so much that I don’t want to “date” a book. For example, to kids, “sick” means crazy or cool, but it’s not used that much anymore – at least not by my students. “Oh, snap,” isn’t used anymore either. I don’t want a teen to read one of my books and think the character is totally out of it because he or she is using “archaic expressions.” Styles change so much, too. Jeans, T-shirts, and tennis shoes are always safe to use though. They are timeless when it comes to fashion. One cool thing is that with sci-fi/dystopian, a writer can come up with their own expressions and style. In MIRROR X, tunics are worn most of the time. I’ve never based a character on a particular student. My characters tend to be a combination of several teens. I’ll pull special things from each one and use them to develop and round out one character. When do you find the time to write? Do you ever allow your students to read for you as beta readers or contribute ideas to your work? Finding the time to write is always a challenge. During the summer, it’s a bit easier, but with MIRROR X releasing just a few weeks ago, I’m still in promo mode and haven’t had a chance to work on anything else. During the school year, I really have to discipline myself by setting the goal of writing and/or editing 35-50 pages a week. I usually reach that goal. So far, I’ve never used a student as a beta reader. Students are so busy with their own studies and sports, it’s hard to find a student who will have time to read anything extra. Just getting them to read 10 pages a night of To Kill a Mockingbird is a challenge. I do have many of them on my street team though. Many of them read MIRROR X and posted honest reviews for me. I really appreciate them for doing that.I’m still building my team, so it helps when my students join. I read on your blog that you are a self-proclaimed “music freak.” Do you listen to music while you write? If so, what type of music do you listen to while writing? I am a music freak. I don’t listen to music while I write though. It can get too distracting because the stuff I listen to is pretty hard. When I jog, I listen to music and use that time to rework plots in my head though. That’s my special “me” time. When my students ask me what type of music I listen to, I ask them what kind of music they think I listen to. OMG! They always say classical or jazz. I can only hope that’s because they think I’m intelligent and sophisticated. Lol. I actually listen to hard, alternative modern rock and classic rock. For example, I love Korn, Breaking Benjamin, Slipknot, Nickelback, Disturbed, three hourBuckcherry, etc. I’m going to see Seether next week at the Ventura County Faithree-hourdrive, but it will be worth it. I love going to concerts. What made you decide to write a dystopian novel? Do you have a favourite dystopian author? I’ve always been fascinated with future worlds. I read 1984 and Brave New World in high school. Both of those books totally fascinated me. As a teacher, I’ve also taught The Giver and Lord of the Flies. Iconsider Lord of the Flies a dystopian, since the society the boys create is so dysfunctional. As much as I love Suzanne Collins, I’d have to say that my favorite dystopian author is Aldous Huxley. I still can’t believe that book was written in 1931. He was a genius. What other genres do you write or plan on writing in the future? I’ve written two paranormal romances (Amateur Angel and Hollywood Angels), but my love is sci-fi. There are two more books in the MIRROR X series, and I’m working on a new sci-fi this summer. In the future, Iplan to continue writing sci-fi and maybe another stand-alone dystopian. The story is in my head. I just need to find the time to write it. The cover of Mirror X is intriguing and symbolic. Can you tell us a little bit about it? I love the cover. My publisher came up with it although I did suggest the hour glass. The hour glass is obviously suggesting that time is running out. In terms of the grass vs. the dry, barren landscape, one is fertile and the other is not. People who’ve read the book will get that. The colors are also symbolic, representing the hope for a bright, colorful future. Mirror X is a modern day Rip Van Winkle story with a Sci-Fi twist. Cryonics is the first controversial theme readers are introduced to in Mirror X, but it leads to a whole hornet’s nest of other hot topic subjects. If you could be cryonically “frozen” and return to life in the future, would you do it? Why or why not? Wow, this is a tough question. I think I would do it, but only if I knew it was actually possible to be brought back to life. For MIRROR X, I did a lot of research into this process. There is a place right now in the U.S. where people can pay to be frozen once they are legally brain dead. The problem is that when cells freeze, the integrity of the cell membrane is compromised, so people can’t survive the thawing process – at least not now in our time period. That’s why Cassie is from 2025 and not 2014. I’m not sure if this problem will be solved in 11 years, but scientists will be closer to finding a way to mend each cell or keep it from bursting in the first place. I’d love to see what the world will be like 1,000 years from now. Besides cryonics, cloning is also an important theme in Mirror X. What famous person already deceased would you like to see cloned and why? If spirits or souls were cloned as well as physical bodies, what famous person would you like to see spiritually cloned in order to meet him/her? Another hard question. There’s more than one. I’d love to see James Dean and Marilyn Monroe because they are so iconic. If souls were cloned as well, I’d pick Michael Hutchence. I had a huge crush on him when I was in high school. He was the lead singer of the band INXS. He committed suicide (although that’s still up for debate) after a drug binge. He made some terrible decisions in his life, but I’ve also read enough about him to know how creative, intelligent, and caring he was. I read an interview where he said he was reading the book Siddhartha by Herman Hesse. How cool is that? To me that says a lot about him as a person. I’d also want to see him perform with INXS or maybe he could even give me a private concert. I found myself highlighting several memorable quotes while reading Mirror X. Do you have a favourite quote and will you share it with us? One of my favorite quotes is when Michael tells Cassie, “Now that you’re awakened, everything is different.” In my mind, I can so vividly imagine this scene. He is hot and sincere. I know a lot of readers go back and forth when it comes to what they think about Michael because he has let Cassie down so many times, but he does genuinely care about her. This is a young man who never had a childhood, and as such, is easily manipulated by the team at GenH, believing that as part of “the team” he has to do as told. I forgive him for his mistakes. And don’t forget – I know what happens in book 2. What can we look forward to in the future from you? Do you currently have a WIP? The second book in The Van Winkle Project series is written. Book three is outlined. I have two WIPs – a sci-fi called Enestia (that’s the name of a planet), and Ashes on the Rhine, a contemporary romance that takes place in Europe. Yeah, I know. ASHES isn’t a sci-fi, but this book is different. It is based on the trip that I took to Europe 2 years ago. My plan is to have MIRROR X book 2 to my editor within the next two weeks, and then I’ll start writing the third. I can’t wait. Finally everything will come together. I want to give special thanks to Karri Thompson for taking the time to answer these questions. I appreciate her thoughtful responses, as well as her support and participation in Band of Dystopian Authors and Fans. I wish her continued success in the future and I’m looking forward to reading more in the Mirror X Saga. Cassie Dannacher wakes up in a hospital over 1,000 years into the future after her space capsule is retrieved from space. She soon learns that 600 years prior to her arrival, the earth was struck by a plague, killing over half of the world’s population. Naïve and desperate, Cassie, who longs for home and is having trouble adjusting to the new, dictatorial 31st-century government, is comforted by Michael Bennett, the 20-year old lead geneticist at the hospital where she was revived.